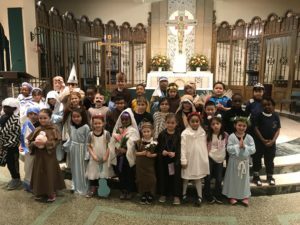 Today, on All Saints Day, our First Graders dressed up as saints and led us in a Litany of Saints during Mass. 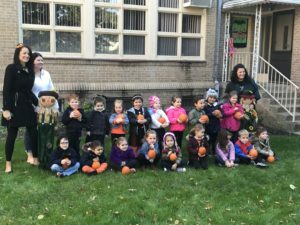 On Halloween, our Jr. Pre-K and Pre-K visited out pumpkin patch, where they got to pick out their own pumpkin. The students then decorated them and had a wonderful time! The students of Good Shepherd Catholic Academy, led by Mary’s Helpers, collected and donated Halloween costumes to children in need. Click on the link below to see how these donations were put to good use. Good Shepherd Catholic academy was a proud recipient of the Mission Incentive award. 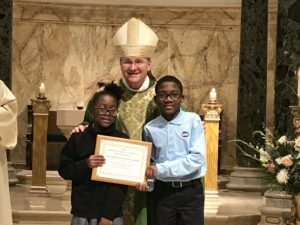 Students attended Mass at St. James Cathedral=Basilica and received the award from Bishop Massa on Mission Sunday. The latest issue of the Good Shepherd Gazette is available now! Click the link below to see the latest work by our student-journalists. 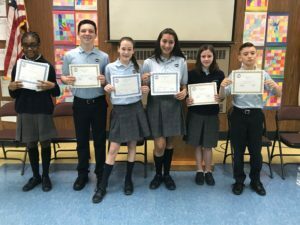 Good Shepherd Catholic Academy was well represented at the finals of the Diocesan Religion Bee. Of the 16 students from all over the Diocese, Good Shepherd had 4! We are so proud of Michael Loccisano, Anthony Pinto, Patrick Glancy, and Ryan Marano! Congratulations to Ryan Marano on winning third place in the 3rd – 5th grade competition! Congratulations to all of our students who participated in the oratorical contest. 8th Grader Alyssia Sanchez will be representing Good Shepherd Catholic Academy at the Diocesan competition on June 6th.